BendPak's HDS-35 Truck Series four-post lift is a whole new breed of rugged. 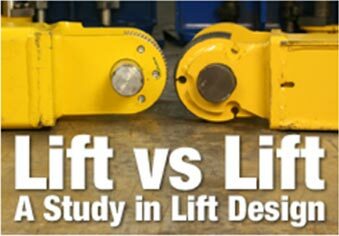 Ruggedly engineered super-duty truck lifts that make light work out of heavy lifting. They work better, are built to last, and feature upgrades that increase safety, durability and productivity. A generous 35,000-pound lifting capacity and extra-wide runways accommodate a wide variety of vehicle configurations. Huge 12” diameter cable sheaves within the runway and cross tubes combined with massive 4” diameter sheave axles dramatically improve cable wear and critical component lifespan. Dual-hub cable sheaves reduce stress, fatigue and wear. BendPak's HDS-Series lifts feature four 3/4” diameter 6 x 25 aircraft quality cables have a breaking strength of over 39,000 pounds each. Aircraft-quality cable is specifically designed for lifting applications and provides a great balance between abrasion resistance and fatigue. 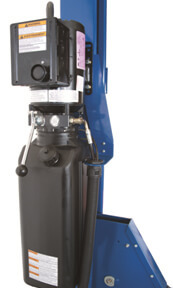 Each HDS-Series four-post is equipped with a single 4” diameter hydraulic cylinder hidden away under the runway for maximum performance and reliability and minimum exposure to elements. The welded cylinder body is made from high strength steel. 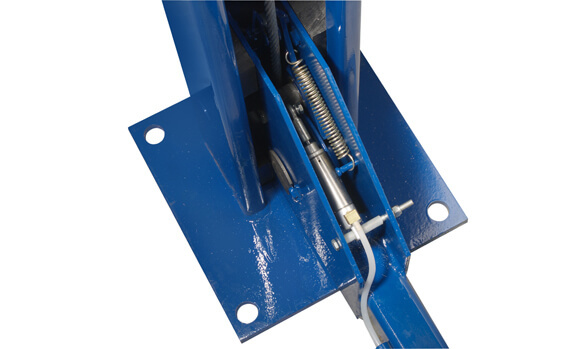 The hydraulic cylinder features a one-piece, pilot fitted, machined steel piston wrapped with high-durometer, mechanically loaded rod seals, pressure loaded U-cup piston seals, backups and wear bands that virtually eliminate any fluid bypass. 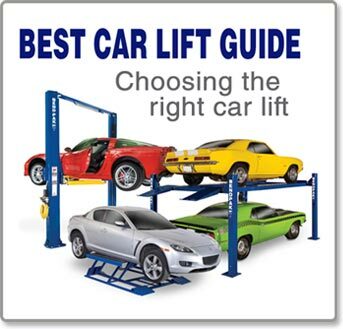 This design ensures straight, smooth, cylinders that will provide years of trouble-free service. A durable powder coat finish can withstand harsh environments. Finished parts are hung on an electro-statically grounded conveyor line, then powder is applied using an electrostatic spray gun. Once the parts are powder coated, the carts are rolled into our curing oven. 12" x 12" base plates provide a solid foundation for the HDS-14. 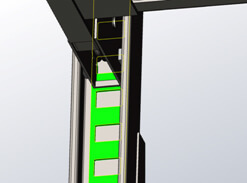 Each column features multiple adjustable height locking positions for variable-height parking and infinite leveling. 12" x 12" base plates provide a solid foundation. 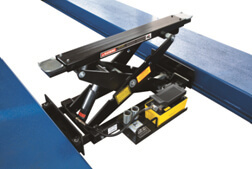 Optional rolling bridge jacks make a great addition to increase service capacity. Bridge jacks are used to raise the front or rear portion of a vehicle off the runways allowing operators to perform efficient wheel and brake service. A pair of jacks allows the entire vehicle to elevated. 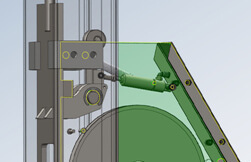 Each jack has telescoping arms and frame contact pads.